Certain artworks offer a profound experience of mystery and that is most certainly true of Quilt of Belonging (quiltofbelonging.ca). This monumental piece of textile art, 120 feet long and 10 feet high, has a wondrous presence that draws viewers in to engage with its visual story. 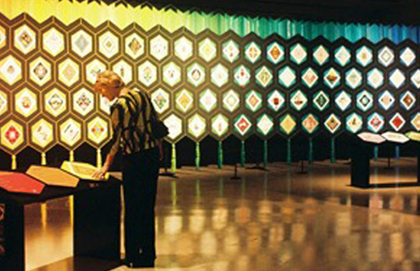 The Quilt’s inaugural exhibition was in 2005 at the Canadian Museum of Civilization (now the Canadian Museum of History). In early summer 2017, Ottawa’s City Hall hosted a return visit - one of many offerings to celebrate Canada’s 150th birthday. The public story of the Quilt’s making is readily accessible at its website, including a 48-minute documentary. The accompanying book, Quilt of Belonging: The Invitation Project, recounts the making stories of all the individuals and groups of textile artists. However, the Quilt’s backstory – the Christian faith of the project’s originator, Esther Bryan – beckons and invites further exploration. Esther’s remarkable faith story discloses the Quilt’s God-backing : a project made on behalf of all the world’s people. Its enduring legacy embodies a global and universal invitation of welcome and belonging that is at the heart of Christian good news. While Esther served as the project’s visionary, Quilt of Belonging is the fruit of many others learning to work together to give it life. The Quilt proclaims in material form the myriad of invisible “people investments” that went into its making. “People first” is one of Esther’s lifelong faith commitments. Many of the Quilt’s workers acknowledge: “What was really stitched was an invisible tapestry of humanity.” As a result, this tapestry, made up of a wide variety of materials and wide-ranging techniques, communicates a powerfully significant message. The Quilt comprises 263 hexagonal blocks of solid colours containing diamond shapes on which many diversely constructed designs are applied. The first row is made up of 70 blocks made by all of the First Peoples living in Canada, comprising all First Nations, Métis and Inuits. The next three rows contain 192 blocks, one for every world nation as of January 1, 2000. Each hexagon uses colours, materials, and designs that represent the respective cultural entities that contribute to the tapestry that is Canada. The upper border of the Quilt is a mirrored light spectrum constructed from 1200 jewel-toned fabrics. This band speaks of light refracted by a prism into its component wavelengths, a visual marker expressing “the entire scope of humanity.” In the centre of this top row sits the maple leaf of the Canada block. Hundreds of iridescent beads were sewn on a red velvet base to form the leaf, while fine gold threads were used to form the veins. The intertwined cording that surrounds each block frames individual identities and creates respectful boundaries as much as it links diverse communities together. All visible Quilt portions are hand-stitched; the out-of-sight ones are machine-sewn. Quilt of Belonging embodies a visual, concrete message about diversity and unity - how people can work and live together in harmony. 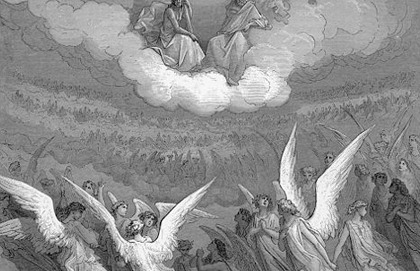 Volunteers – from particular faith traditions or avowed atheists, young or old, experienced or novice stitchers, able-bodied or disabled – were freely invited to share in the project. This “place for all” serves as the thematic principle embedded in the Quilt, as much in its process as its design. In making the Quilt, Esther wanted to show that God has made every human being unique and special, that there is a place for each one in the world: belonging. The project was a response to God’s call to her, a call she carefully prayed about and examined for a whole year before starting. Esther needed to be certain the project – considered impossible by many – was truly God’s invitation. Once started there could be no turning back. The trust and faith lessons that Esther learned about God’s timely provision as a missionary child, and throughout her adult years, came to the forefront in starting Quilt of Belonging. From her tiny village, God began to provide the first missing pieces, workspace and offices in a large, rent-free, township building in the centre of town, and finances. Time and again over the six and a half years of construction, the subsequent “missing pieces” were provided: a retired Canadian ambassador living a block away to advise on political and cultural protocol, the only man in Canada from Kiribati calling one afternoon to make a block, meeting a well-known Canadian publisher in a little shop who agreed to publish the book, hundreds of amazing people, skills, and items appeared. One by one, all the needed and “impossible-to-find” pieces and people emerged and fit together in the most remarkable ways. Esther recognizes that God had been preparing her years ahead for the task of making the Quilt, which began in 1998. Her many years of art-making with wide-ranging media including paint, pastels, molded cornstalk paper, wood sculpture, textiles and beads, and more, provided the tools and foundation she needed to conceptualize, design, and make the Quilt. Childhood and adult-honed sewing skills proved crucial. Post-secondary studies in mathematics and physics were essential for design and construction. Decades of study in philosophy, art history, textile arts, music, and literature paved the way to translate abstract ideas into visual language. Visible and invisible, the assembled pieces in this huge project have a reach extending farther than any of the Quilt’s makers could have ever imagined: three million visitors to date; education components in Canadian school textbooks; free online education resources in multiple languages; books, the documentary, and much more. The project bears visible and invisible witness to the faith message that those who came together in the fellowship of creating Quilt of Belonging embody God’s love-generated purpose: the belonging of all people in our world. Photo Credit: Panoramic Shot - Nick Wolochatiuk. Other photographers - Quilt of Belonging. Sharon is an Ottawa fibre artist with a new-found passion for the ’slow art’ of encrusted beading. Peggy is a UK-based Canadian who is a quilter and textile artist.